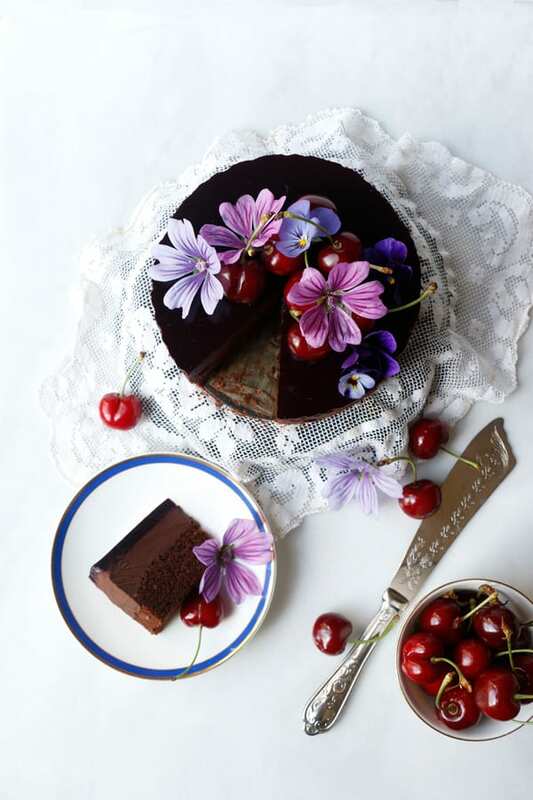 Cherries are coming into season and I’ve created the most delicious Cherry Chocolate Mousse Cake to celebrate this time. 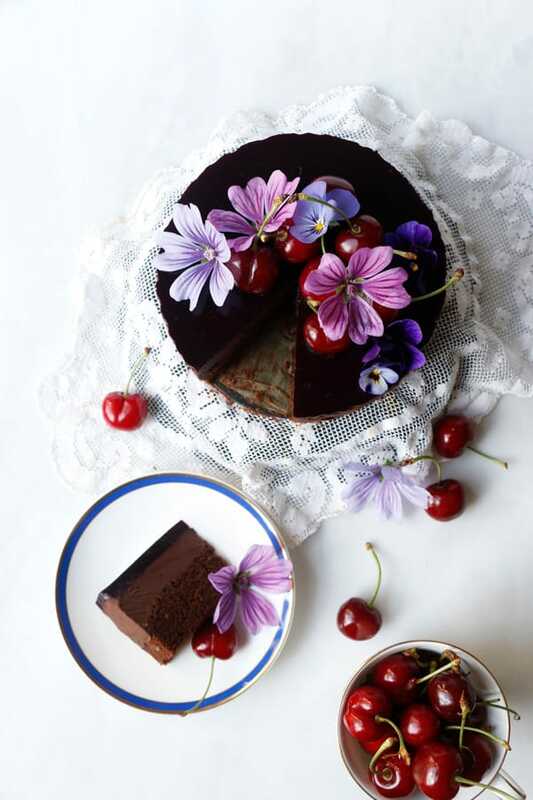 It’s just the perfect Summer dessert for the chocolate lovers. 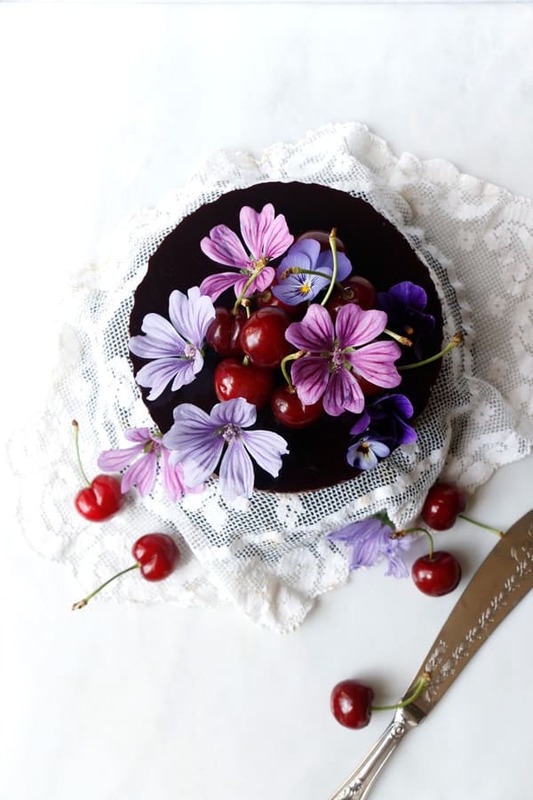 There are three different layers in this cake, base is a chocolate sponge cake which is covered with smooth chocolate ganache and then topped with sour cherry jelly and decorated with fresh cherries and edible flowers. 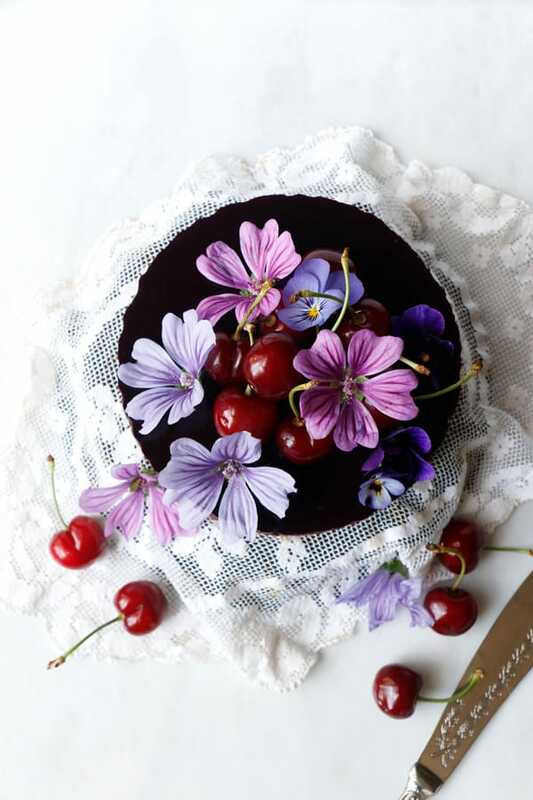 This cake looks so pretty, it’s calling on Summer. 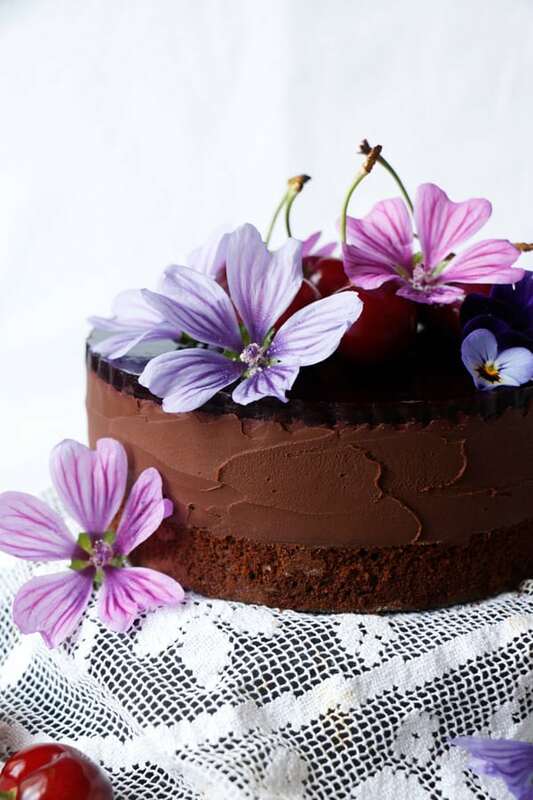 For the base of this cake I’ve used a variation of my Raspberry Chocolate Madeleines recipe, which is beautifully moist and really wholesome. This time I’ve used ground quinoa flakes, but feel free to use gluten-free oats if you prefer. 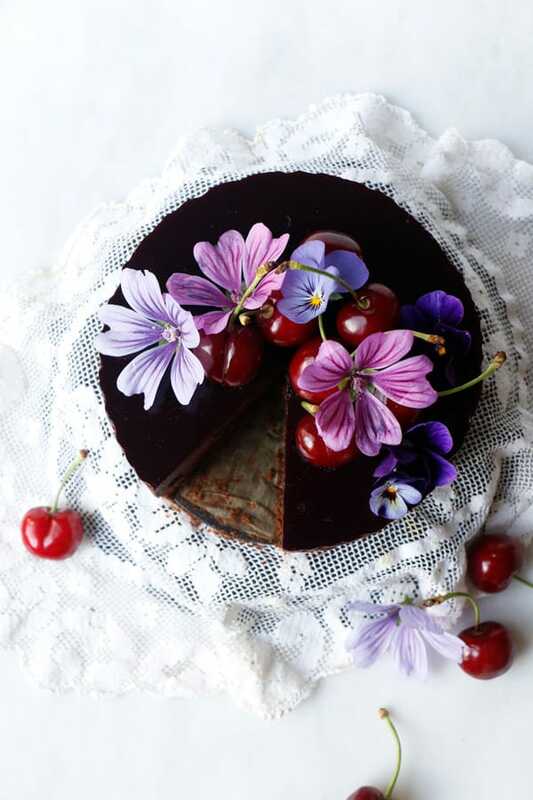 The chocolate ganache is a simple mix of dark vegan chocolate and oat cream, which sets into just right consistency to hold the shape. 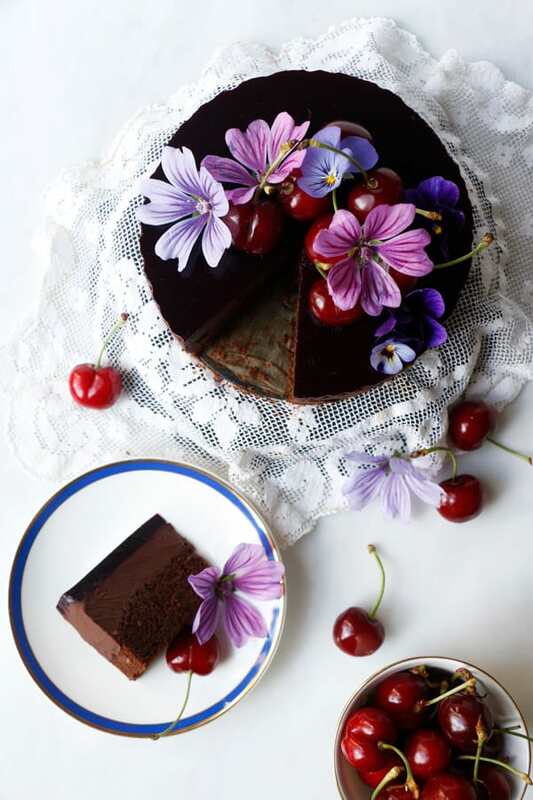 And for the zing I have topped the cake with sour cherry agar jelly which creates a beautiful glossy finish. I’ve lined the inside of the cake tin with some greaseproof baking paper before pouring the ganache, but it caused my sides to go little ridged so I’ve used spatula to smooth them out. You shouldn’t need it when using a springform cake tin. But you might want to run a knife around the edges before removing the cake from the tin. Grease and line 6" round springform cake tin. In a large bowl whisk together brown rice flour, ground sunflower seeds, ground quinoa flakes, arrowroot, cacao, sugar, baking powder, bicarbonate of soda, cinnamon and salt. Set aside. 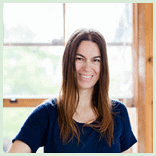 In a small bowl whisk together flax eggs, olive oil, plant milk, apple cider vinegar and vanilla. Add the wet mix to the dry mix and mix until well combined. You should have pourable muffin consistency. Spoon the mixture into lined cake tin and bake for about 20 minutes or until a cocktail stick comes out clean. Remove from the oven and leave to cool down. Chop the dark chocolate and place into a small bowl. In a pan heat oat cream on a low fire until it comes to a boiling point. Pour over the chopped chocolate and stir until completely melted. Stir in the maple syrup and set aside to slightly cool down. Now carefully pour the ganache onto the chocolate cake layer. Place into fridge for about an hour to set. Place the cherries into a small pot, add water and bring to a boil, gently simmer for 10 minutes until broken down and mushy. Press the mixture through a mesh sieve. You should have about 300ml (1¼ cup) liquid. Now pour it back into the pot. Stir in agar flakes and maple syrup and bring back to a boil. Leave to simmer for about 15 minutes stirring frequently until the flakes have dissolved. 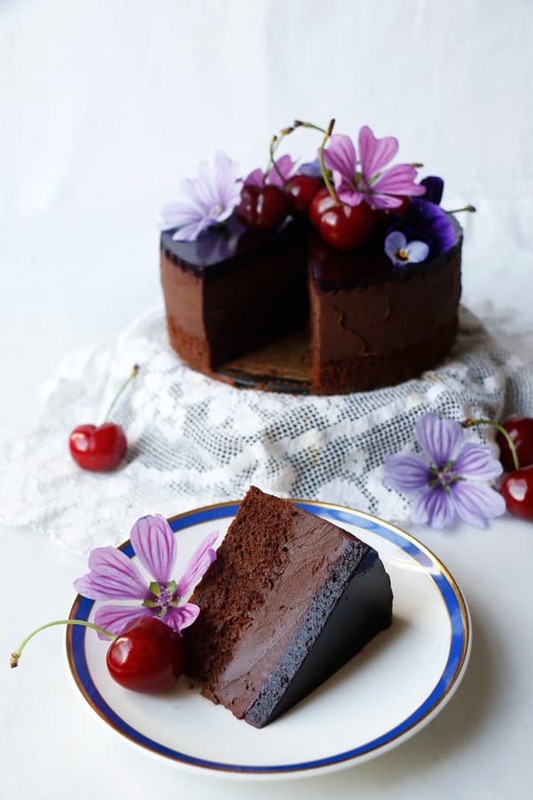 Take off the heat and leave to cool down before carefully pouring on top of the chocolate ganache layer. Place back into fridge to set. 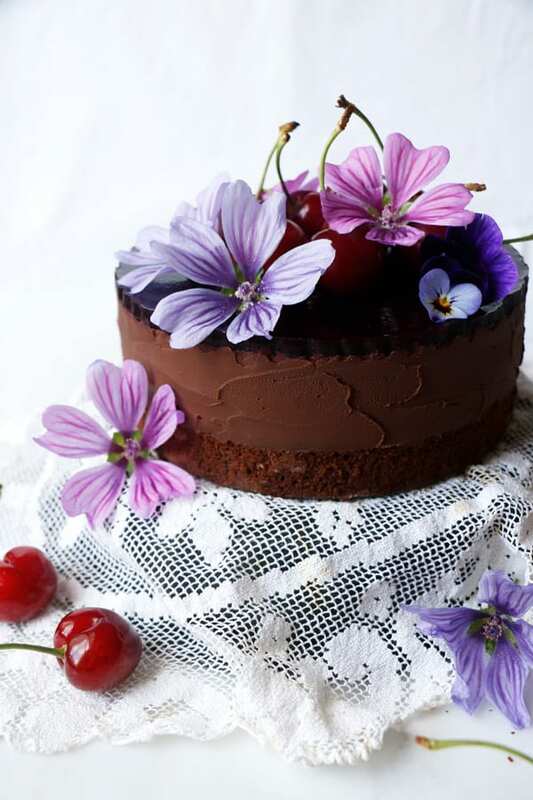 Gently remove the cake from the cake tin and place onto a cake stand. 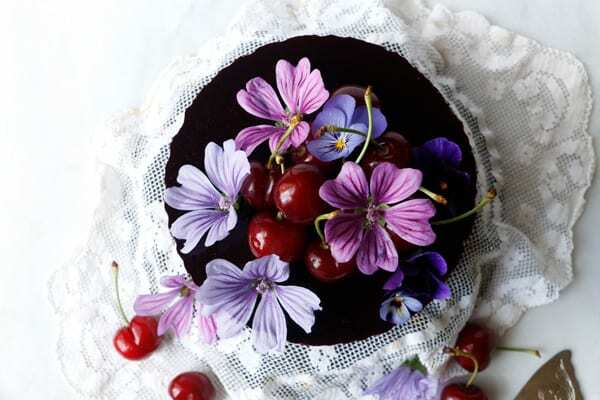 If needed smooth out the side of the cake with spatula and top with some fresh cherries and edible flowers if you wish. If using fresh cherries for the jelly, 2 cups are about 300g. You can replace oat cream with coconut cream. 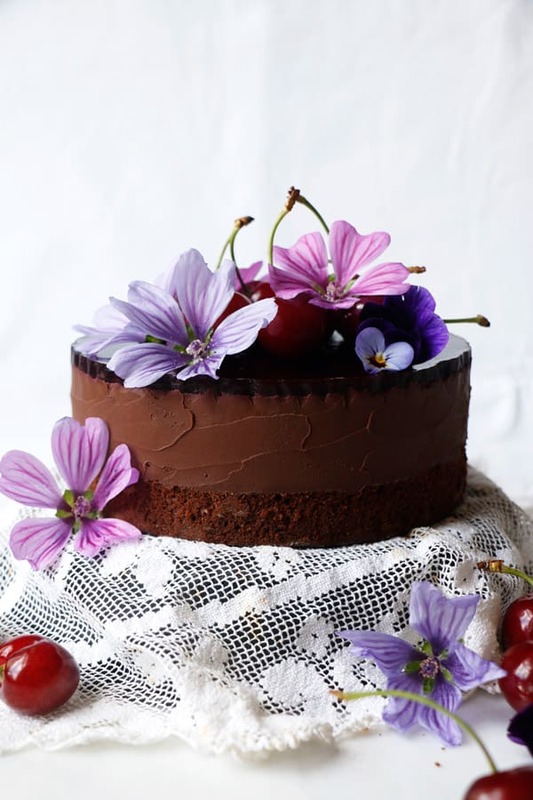 Use 150g chocolate and 240ml coconut cream. Hi! This looks amazing :) Quick question, what exactly is oat cream? Do you have a recipe for it?